Time to sharpen your captioning skills! First off, a reminder that this weekend is the SparkFun Autonomous Vehicle Competition! We hope you'll join us for an awesome day of fun and robotics! Leave your funniest clean caption in the comments section below. We reserve the right to delete captions that we deem inappropriate. We’re not too stingy, but try to keep it moderately PG-13. Captions will be accepted from the moment this post goes live until Friday, June 20th at 10 a.m. Mountain Time. The winner will receive $100 in SparkFun credit! Leave your comment below and good luck! "We're now a quarter of an inch tall, and sixty four feet from the SOLDERING IRON. That's an equivalent of three-point-two miles. That's a long way. Even for a man of science." Preppers....one showing off his silver solder stash the other executing his right to bear ARMs. Introducing Sparkfun's most expressive contribution to the Open Source community. Their new Rap Album (feat. Dr. Kiss and 328 Cent). Includes hits such as Don't Stop Programming, We are never ever getting it back together, and Atmel by Morning. This is why you don't buy electronics made in Texas. We're going to need a bigger board. We're gonna make that Big Time Watch literally BIG! Hallmark's failed Fathers' Day card. Message says, "A big kiss to a chip off the old block"
It's not so much of a microcontroller anymore, is it? The Sparkfun employee game of charades was frustrating. The secret phrase was thirty two thousand bites, but the guesses were all about chocolate chips. Will and Ted believed everyone would know the program memory size of the ATMEGA328. The effort required to consume the large amount of chocolate was equally obvious. Frustrating. The new AtMega Mega Chipset for the Arduino MEGA! Hobby electronics: Where bit-banging is cool, a third hand is awesome, and having a good old solder sucker can sometimes make your day. Also, all the girls are intelligent, all the guys have huge components, and the greatest fear is that your chip might be too big for its socket. I don't care how much solder paste you have, you can't solder it, it's through-hole! These engineers just get too excited by the new ATSuperMegas. Sheesh! Were down to make anything bigger and better. DIPS and chocolate chips especially. Kiss and Chips - Every nerd's favorite combination. Introducing the Arduino Maximus! First 100 orders get a free Mega Hersey Kiss. IC you.... and I brought you chocolate. Oh Yeah... we got your Chocolate Chip right here!!! Which chip is your favorite? Vote in the comments below! OMG! From the looks of things we've been shrunk! Yo, here we're not cheapppppp, we sell only big chipppppppps, oh yeah ! Those aren't the kind of kisses you want on your MEGA. The experiment to expand an AVR to gargantuan size was a success! However, it now produces gigantic solder poops, which is not so nice. The super sized ATmega is still smaller than Intel's 4004. Will and Shawn pose with the chip set of the first generation of cell phones. No wonder they were so big! Put the soldering iron down or the chip and kiss get it. This week, Will and Shawn demonstrate the AtMega328's new compatibility with Bluetooth and "Sweetooth". Introducing a new data communication protocol produced by the unique collaboration between Hershey's Chocolate and Atmel Electronics: Sweetooth! Introducing the new Atmel size standard "Iphone5s" and you get new fangled lightweight soldier to use with it, go big or go home. Shawn and Will pose after being hired by Zordon to rebuild the Power Rangers' zords for AVC. Go! Go! Power Rangers! Probably should add these to your next Sparkfun order, guys! Really? learn.sparkfun.com now targeting the visually impaired? The hard part is the AA battery model - clearly a two person lift! Here's a long-distance dedication from Boulder, Colorado; Keep your feet on the ground and keep reaching for the stars. Did anyone check with the Hacker-in-Residence? Experimental Dimmer gone awry? At big-evil-hardware company we'd do a die-shrink first. Did something go wrong here? Oh, no! Two more Sparkfunions stuck helping that Nick Poole! Hardware engineers back from their big shopping trip! Today's hardware lesson teaches us about scale. What's the big idea, guys? We'll have more kissin' and dissin' next time on, "Yo, MTV Hacks!" Will shows off his super smooth pictographic flirtation style. "I, Will, Give you Mega Kisses"
With SMDs dominating the small chips, Sparkfun gives the DIP its true place! Introducing the "BIG DIP", DIP's as they should be, and dont worry were giving enough solder to solder this chip atleast 10 times over!! "This is the the way that you should solder an ATMega 328 chip.....just don't add this much solder to it BTW WARNING: DO NOT PLAY MUSIC WHILE SOLDERING OR YOU MIGHT FORGET YOUR SOLDER ON! " A reliable source leaked a photo of Sparkfun's secret experiment slated to be the ultimate Raspberry Pi killer, the "Kiss Box". No word yet on whether Hershey's has bought off on the idea or if initial prototypes have made it through customs. We finally carry the new Arduino Massive; as an added bonus, each order will be packaged to look like a giant pillow! Homegrown Boulder style yo!...all lead-free! After being shrunk to 10 cm tall by their Arduino powered project, Will and Ted are sure that reconfiguring the ATMEGA328 using the foil from a Hershey's kiss will reverse the effects. Maybe. What happens when a Hershey's Kiss and an ATMEL AMEGA328 mate? Sparkfun babies!!! I got your MEGA right here! Now kiss it! Parts from Sparkfun: $120. Shipping: free. Recreating Honey I Shrunk the Kids: priceless. "Your ICy MCs: 'I' flows alot and Magic Smoke"
Dr. ATMega & DJ White Chocolate presents "Don't Touch my Solder"
Shawn the soldering iron with a solder blob & Will the helping hands with a Atmega, ready to be soldered just need a sparkerson to do that. Hey Shawn, I will trade you my Hershey's Bar for your Giant Hershey's Kiss! Deal? Next Ardiuno rev is sponsored by Hershey and will be called "Cioccolato"
Electronics hobbyist many ENIAC years ago! Electronics hobbyist many ENAIC years ago! Now introducing the engineers version of a chocolate chip! SparkFun the only place where you can get your thermite shaped like a hershy's kiss and the new macro controllers from the same store!!! Maker's version of kiss and tell, Kiss and Atmel. Next week on 'Kisses and Chips', the guys demonstrate the power of the Atmega328-PU. Someone has finally captured a picture of the elusive "SMT" elves. See how they proudly display the bag of magic smoke right before they insert it into the IC. They say science is built on the shoulders of giants. Not here. Our giants were too weak to lift our PCBs. NEWSFLASH; "Sir "Cut" bored by Hershey kiss." You didn't misplace those components. The Borrowers also embrace Open Source. Sparkfun Lady Gaga Parody video. Obviously, one just wants to be kissed. The other wants to show that he's not made of silicon! "You've all seen peanut butter and chocolate, but Sparkfun's new combination is shockingly delicious." "You got your chocolate in my Atmel!" "You got your Atmel in my chocolate!" "Two great chips that go great together!" It works! The Sparkfun Wonkavision kit is now available as a through-hole soldering kit. Retail packaging also available. Open Source Hershey's Kisses... That's right. That's what I call a giant chocolate chip Mr. Rebus! No more fighting. I'll give you a big kiss, and you take that big chip off your shoulder. Well I suppose this is a different way of looking at it when I said make those joints smaller. This is a PIC of a macrochip!!! Hi friends, here is our big pic ... sorry our big Atmel!!! DJ Hymel and DJ TalBott team up for the first time since the 60/30 Tin/Lead album to bring you their new remix, "ROHS 8-Bit Innuendo" where they lay down some of the nerdiest and hardest hitting 8-bit tracks since Super Mario! Only available in Dip-32 and LQFP. When we asked our marketing team to host a huge Atmega sale by offering a sweet deal, they took it way too literally. Shawn: This isn't what I meant when I said "give me a big kiss"
Will: In this next tutorial, I will be teaching UART. And not the watercolour kind. SERVICE ANNOUNCEMENT: All future product shots will be done in this format, for reference; Shawn is currently 5 7/8 inch tall and Will a round 6 inch. The new Sparkfun rap duo, Big Chip. Shoot! I knew that Moore's Law couldn't go on forever. Now it has shrunk US! What am I supposed to do with this MEGA ATMega? What are you complaining about? Now you can actually see the bits inside the chip, programming it should be a snap. What about ME? If the Hershey's kiss is this huge, I am terrified of WHAT COMES NEXT! IC two huge nerds with a huge IC. When the great Nate said the company needed to "down-size", his unwitting employees had no idea his reference to size should be taken LITERALLY. Now, in addition to befriending ants and sleeping amongst the grass blades, the shrunken Sparkfun staff need to be fearful of RC lawnmowers - and ESPECIALLY autonomous lawnmowers, coming this week to the AVC! Its going to take this much solder to make the Arduino for Atmels newest addition to the ATmega family. It was surprisingly easy to retrain the oompa loompas for electronics manufacturing. The free Hershey's kiss with each chip purchase promo just never had the right feel to it. ... and now, with the newest SparkFun components, you too can build your very own 3D printer! What will YOU print first? If you eat that Hershey Kiss you'll get a little bit of lead poisoning! Are we not men? We are micro! Alright, who's been messing with the Transmogrifier? Whats is the silver sack for? A beanbag chair for Will's megacontroller? I told you we'd get the design down to one I.C., ... but this is how much solder you'll need. Hey kids, we're here to rap with you about the boards and the bees! Guys, somebody get me the Chip-Quick.... No...not a chocolate chip! Arrg... not a microchip either! Look, I appreciate the effort but you've got to learn the products! How this for a blast from the past - VLSI! Introducing the Chip bothers! Chocolate and Micro! 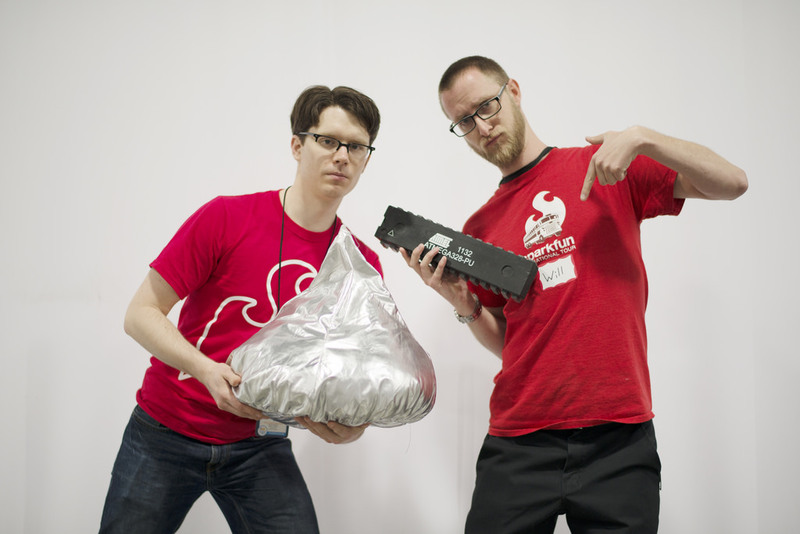 And now live from Sparkfun Amphitheater, Mc Uno's new song "CHIPS Are Better Than Kisses"
Yo dawg look my GF gave me this giant chocolate kiss! Are you kidding me?? My GF got me this huge ATMega chip. That's true love right there! The nerdcore tv show "Chocolate CHiPs", was never quite the same without Erik Estrada. This thing is burning my hands, photoshopping the rest of the guitar in will have to wait. All right, who ordered the extra large kiss and chip?!?! Giving tons of kisses to Will on his birthday. Microchip ?! HELL NO! we invented the Macrochip! because BIGGER! is better! Right?! You think you know through hole? Check out this cold joint. I got 99 problems but a Kiss ain't one... chip me. Or:) I got 99 problems but a Chip ain't one... Kiss me. Yo! check out the new MEGA MEGA kit from Sparkfun. Super easy through hole soldering and we are even throwing in a bag of solder paste for that new board you are planning to build...it's gonna be huge, yo! Knobs made it easier to finish this project and adjust the level of our shrink ray. Eat-duino! The all new edible electronics platform including Hershey kiss solder, and silicone chips! Announcing SFE's new "Super Product" line. Our first two offerings come in Chocolate and Silicon. SparkFun's new micro parts pickers - the secret to their uber cool pick n place machine. Their new rap video "Life iz all 'bout da Kisses n Chips" did not turn out to be the break-way success that Clive and Zeke had hoped. I don't know who this guy is but my name is Will. And for the visually impaired: Macrochips!!!! Having Erred Really Sizedly, Helpless Engineers Yell, "Sparkfun!" Keeping IT Simple & Sparky. Reading Electrical Diagrams, Soon Having It Running Totally Safe. As you can see, our experiments merging the macro-photography lens with the transporter pattern buffer have been a complete success. Our Mega Chips bring all the nerds to the yard, and they're like - "it's better than yours!" The two most common items found in the Spark Fun employees' drawers. Sparkfun introduces "Soldering for the Complete Klutz"! All through hole practice kit scaled up for those geeks suffering from severe motor coordination issues that have led to so much frustration on regular PTH soldering kits, get one today! Honey, I shrunk the employees! The newest flavor to the Hershey kiss collection. 2.Aint no one gonna take a byte out of these chips! Sweet tooth or Blue tooth? In today's news: 2 Hackers were accidentally shrunken while working on their top secret death ray project. The suspects can be seen here holding what appears to be a giant blob of solder and an ATmega328.